The BOSS Network's Influencers Event in Washington, DC! After months of planning and tweets about our Inspired by Influencers tour, we finally hit the road for our first event in Washington, DC this week. Held at the ultra fabulous L2 Lounge in the Cady's Alley area of Georgetown, we highlighted 10 "Influencers" from the DC Area who truly embodied a BOSS. Michelle Hargrove, founder of Restoration Wknd, played hostess for our Q&A sessions with our "Influencers" and keynote speaker, Valeisha Butterfield. 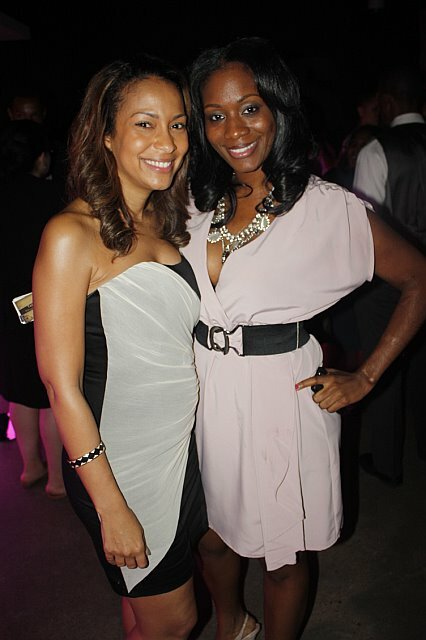 Guests were able support their favorite honoree, network, receive free makeovers, and sip on our special "BOSStini." Everyone came looking their best! There was so much positivity and encouragement in the room and we just want to thank everyone for their attendance! We have to thank our awesome event planners, Jamilah and Lindsey of The Jalin Group, for all their hard work, the L2 Lounge for providing such a great location, DivasMPH for reminding us all to do our part in the fight against HIV/AIDS, MadlyLiving for their wonderful Bed and Breakfast, and, finally, our DC BOSSes for supporting The BOSS Network enough for us to launch our tour in that great city. Leave a comment if you attended or watched along via UStream! Valeisha M. Butterfield is the Deputy Director of Public Affairs for the International Trade Administration, Chair of the Women in Entertainment Empowerment Network, television personality, talk radio host and recognized expert on programs designed for minorities and women worldwide. For more than a decade, Butterfield has distinguished herself as a personal and professional conduit for change. Butterfield was appointed to the Administration of President Barack Obama in October 2009 as the Deputy Director of Public Affairs for the International Trade Administration (ITA) in the United States Department of Commerce. ITA strengthens the competitiveness of U.S. industry, promotes trade and investment, and ensures fair trade and compliance. In this capacity, Butterfield supports President Obama’s national economic agenda to revive the global economy, create jobs and renew growth that benefits all people. Butterfield is also the Co-Founder and Chair of the Women in Entertainment Empowerment Network (WEEN). WEEN is a worldwide coalition of women, all ages and races, committed to supporting, promoting and defending the balanced, positive portrayal of women in entertainment and society. The organization was established in 2007 and has over 40,000 members worldwide. WEEN provides entertainment-based educational programs on health, financial literacy, career development and personal advancement for young women nationwide. For more than six years, Butterfield served as the Executive Director of the Hip-Hop Summit Action Network under the leadership of its Founder and Co-Chair, Russell Simmons. Butterfield was recognized for her leadership as one of the youngest executive directors in the United States, developing critically acclaimed financial literacy and voter education programs for young adults 18 – 35 year old nationwide. Butterfield was selected by ESSENCE Magazine for their Power Issue in 2010 and featured as one of the nation's Top 40 Under 40 for her professional leadership. We cannot wait to meet Ms. Butterfield and our 10 Influencers at tonight's event. If you are in the DMV area, you do not want to miss this! Register here! On Tuesday, September 7, 2010, The BOSS Network embarked on the Inspired by Influencers Tour with a prelude to the Influencers event - the BOSS Business Brunch. Fifteen women joined us at the fabulous Private Stay by MadlyLiving Bed and Breakfast to dine, inspire, network, and share their stories. The owners of MadlyLiving spoke on health and wellness and following the path (or lack thereof) intended for you. Special guest speaker Tisa Silver shared a personal anecdote from her book, The Time Value of Life, to inspire women to get out and live TODAY. We hope that the women in attendance, and those who followed our tweets, were able to gain new perspectives and be encouraged in their journeys. Candice Camille and Mariby Corpening are the owners of Private Stay by MadlyLiving, a Bed and Breakfast Accommodation for travelers in the DC/MD/VA National Capitol Area. "Private Stay by MadlyLiving is a dream sustained that became true – our 4-bedroom home/office suite - each unique - infusing our wealth of spirit, wellness, fitness, passion and pampering - OF SELF! Accordingly, we’ve created an outstanding – and we might add, worth branding – experience in private stay accommodations – a purpose-filled suburban retreat, where the single, coupled, small-group business, leisure and/or even local traveler can stay as guests in our uncommon residence, to de-stress – discretely, comfortably, affordably, peacefully – unwind, sleep (and I mean) well, greet, meet (and please, do tell), tour, explore and/or just do your business in and around the National Capitol Area. Mariby is founder of Bed and Breakfast Network of Prince George's County. She is also a member of Professional Association of Innkeepers International (PAII), Bedandbreakfast.com, Prince George's Chamber of Commerce, Sport, Entertainment and Planning Committe of the Chamber of Commerce, and Tantallon North Area Civic Association. We will highlight Ms. Candice and Ms. Corpening and nine other phenomenal women, at The BOSS Network's "Influencers" event on September 8, 2010 in Washington, D.C. You can register for the event here. Come out and be inspired!